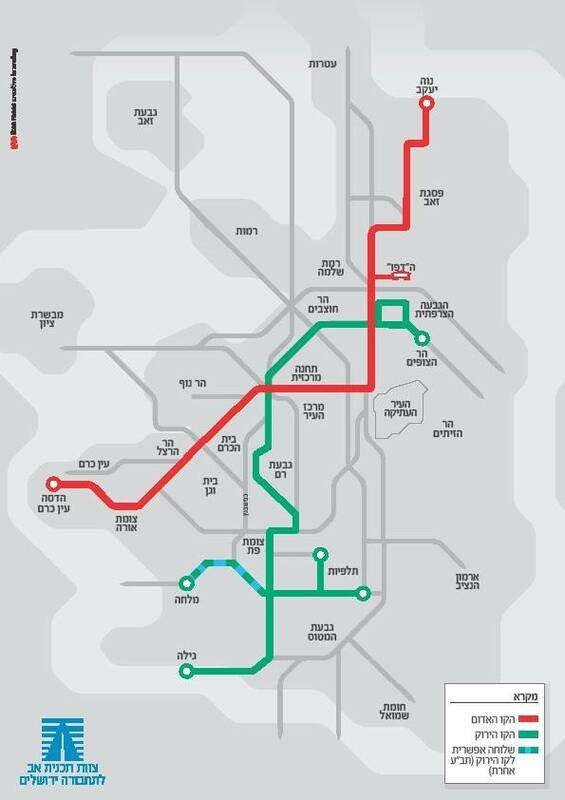 The new light rail line will run from Gilo on the southern side of the city, via the Hebrew University Givat Ram campus and will terminate on Mount Scopus. It will serve the Jewish population, as well as the Arab residents of Beit Safafa, Issawiya, and Wadi Joz. A French court rejected an appeal by a Palestinian group that claimed that the light rail project is in violation of international law. While the debate over the political status of Jerusalem grows more volatile and the United States prepares to transfer its embassy to the city, the area continues to speak its own language. Apart from the controversy over the city’s future, further layers in the fabric of shared life and coexistence between Jews and Arab continue to be spun. The most recent, significant development in this area concerns Jerusalem’s light rail project. Over the past few days, work has begun on the infrastructure necessary for the construction of the Jerusalem light rail service’s new “Green Line” in the areas of Mount Scopus, Sheikh Jarrah, and the Patt Junction.2 This will be the light rail’s second line, which, like its predecessor, will serve the Jewish and Arab populations. Both the first stop and the terminus of the line are points that were added to the city of Jerusalem when it was reunited in 1967: Mount Scopus in the north and the neighborhood of Gilo in the south. Israel laid the foundations of Gilo 46 years ago, in 1973, as part of an array of Jewish communities that were established in all parts of Jerusalem following the Six-Day War in 1967. Today, around 35,000 people live in Gilo. During the second intifada, the local Jewish residents suffered from constant gunfire from Beit Jala and Bethlehem, areas that were transferred to the control of the Palestinian Authority. During Barak Obama’s tenure as president of the United States, construction in the area slowed down, but it has since been renewed. Until 1967, the northern end of the new line, Mt. Scopus, was an Israeli enclave within a demilitarized zone. It could only be reached by traveling in an organized convoy through Jordanian-held territory under the supervision of the United Nations. During the Six-Day War, Mt. Scopus was liberated, including the Hadassah Hospital and the Hebrew University, whose activities on the mountain had been curtailed in 1948. After 1967, they resumed their activities, and today Mt. Scopus is bustling with life. Both Jews and Arabs study at the Hebrew University campus there, and the Hadassah Mt. Scopus Medical Center also serves both populations. The medical staff is “mixed,” including Jewish and Arab physicians and nurses. When completed, the Jerusalem Light Rail’s “Green Line” will serve around a quarter of a million of the city’s residents. It will connect both campuses of the Hebrew University on Givat Ram and Mt. Scopus, as well as the large industrial centers in Talpiot, the city’s larger neighborhoods, and the huge commercial and leisure facilities in Malcha, including Jerusalem’s sports stadium, zoo, and shopping mall. The planned line will be 19 kilometers long. As mentioned earlier, it will start in the south, in Gilo, and in the north, it will continue to Ramot Eshkol and Mt. Scopus. On the way, the line will pass through the following streets: Dov Yosef, the Patt Junction, Herzog, and the Beit interchange, and cross the Hebrew University campus in Givat Ram. It will also pass through the city center and continue along Sarei Yisrael and Bar Ilan Streets, through the Levi Eshkol Boulevard, until it reaches the Mt. Scopus campus. This route will serve a large Jewish population, as well as the Arab residents of the southern neighborhood of Beit Safafa and the northern districts of Issawiya and Mount Scopus, the American Colony, and Wadi Joz. Additionally, the line will include a branch to the Malcha Mall and the industrial zone in Talpiot, from Haparsa Street, Pierre Koenig Street, and Hatenufa and Rivka Street. This branch will be about 3.1 kilometers in length. According to projections, there will be about 140,000 rides on the Green Line every day, and the line will contain a total of 36 stops. As mentioned above, work on laying the infrastructure for the new line began a few days ago. The rails will be laid in November 2021. The carriages will arrive, and test runs will begin in 2023. The line is expected to start running in July 2024. The Red Line, which opened in 2011, between Mt. Herzl and Pisgat Ze’ev, will be extended at both ends. In the north, it will be lengthened from its current terminus in Pisgat Zeev to end in Jerusalem’s northernmost neighborhood of Neve Yaakov. Its southern terminus will be at the Hadassah Ein Karem Medical Center instead of Mt. Herzl, where the line ends today. This line also passes through Arab and Jewish neighborhoods that were not part of Jerusalem until 1967, such as the Arab neighborhoods of Shuafat and Beit Hanina, and also the Jewish neighborhoods of Pisgat Ze’ev and French Hill, and eventually Neve Yaakov. Israel constructed these three neighborhoods when Jerusalem was reunited after the Six-Day War. Today, they are home to around 75,000 Jews. Work on extending the infrastructure for extending the line is currently under way. The lines are planned to be laid in November 2020. The first carriages will arrive in the first quarter of 2022, and the line is expected to start running in October 2022. In recent years, aside from sporadic acts of violence and terrorism, the Jerusalem light rail has become a symbol of coexistence and the continuation of normalization. The residents of Jerusalem take 200,000 rides on it each day, and it serves tens of thousands of Jews and Arabs. Until a few incidents of terror and violence that broke out in Jerusalem in recent years, there were no violent interactions between the passengers of both communities. It is no coincidence that the proponents of the “Jerusalem intifada” targeted this symbol and tried to harm it. In 2014-2016, the railway became a target for hundreds of Molotov cocktails and stone throwers. In the face of these violent incidents, the Israeli establishment, including Mayor Nir Barkat, Transportation Minister Yisrael Katz, and the security forces in Jerusalem, insisted on continuing to run the train through the Arab neighborhoods of Shuafat and Beit Hanina. The public, both Jewish and Arab, eventually voted with their feet. On the carriages of the light rail, Jerusalem coexistence continued. More than any other shared aspect of life, it reflects the continuation of normalization in the city. Several years ago, the European Union surveyed the Arab neighborhoods’ satisfaction with the light rail, but it refused to publish the results, which in general praised the Israeli project. Opponents of the light rail opposed the symbol of coexistence in Jerusalem and conducted unsuccessful legal proceedings in France. They attempted to prevent its operation on the grounds that it contravened international law. The France-Palestine Solidarity Association, a French-Palestinian human rights organization, filed a claim at a French court3 against two French companies – Alstom and Veolia – which were involved in the light rail project. Alstom manufactures the railway carriages and rails, while Veolia operates the trains. The plaintiffs sought to rely on a clause in French law that allows a court to annul any contracts signed by French companies if these contracts violate international law. The France-Palestine Solidarity Association claimed that since part of the project is located in areas in east Jerusalem, this was a violation of international law as it involved construction in occupied territories. The regional court in Paris ruled several years later, in 2011, that the light rail project was constructed in accordance with the law and did not violate international legislation. This was the case even though parts of the route pass beyond the 1967 boundaries. The court also ruled that even though this did concern “occupied territory,” the train line improved conditions for the population “under occupation” because it also provides a service to the residents of east Jerusalem. The French court’s ruling was based partly on Clause 43 of The Hague Convention, which states, “Once an occupier takes control over the occupied territory, it has to take all the measures within its power to restore and ensure, as far as possible, public order and safety, while respecting, unless absolutely prevented, the laws in force in the country….” During the hearing, the court refused to allow the PLO to join with the plaintiff. When they issued their ruling after seven years of debate, the plaintiffs were ordered to pay the sum of $117,000 to the French companies as compensation. The tender for constructing the Green Line and extending the Red Line4 was issued as a kind of partnership between the state and private franchises. The state is responsible for arranging statutory planning and the evacuation and removal of existing infrastructure. The private company that wins the tender will have to finance and carry out the work on the railway tracks, manufacture the carriages, and operate the electricity system and the actual line (as the CityPass company does today). In December 2017, in spite of earlier concerns in the government, eight international consortiums submitted their applications to the early bidding process for the tender to expand the light rail in the city.5 The tender is estimated to be worth billions of shekels. The applicants are Chinese and European companies. Some of them are partnered with Israeli-owned groups. They include the French company Meridian, the German company Siemens, C.E.F of Spain, and the Chinese C.R.R.C. The conglomerates that have applied for the tender include an operator, a carriage manufacturer, and a company for laying the rails, establishing communication systems, and providing funding. Over the next few weeks, an inter-ministerial tenders committee, in cooperation with the Finance and Transportation Ministries and the Jerusalem municipality, is expected to announce which companies fulfill the tender’s preconditions. By the end of 2018, any companies that fulfill the preconditions will be obliged to submit their offers, and in April 2019 the winning company will be announced. In 2020, the winning company will have to start work based on the infrastructure that the state and the city are laying down right now.